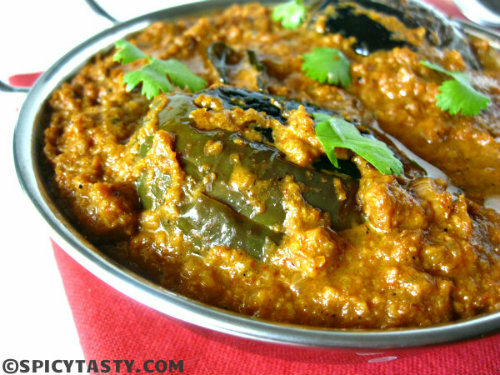 Stuffed Eggplant Curry is a spicy, tangy and peanutty curry in which eggplants are slit and stuffed with a spicy masala and cooked in a spicy nutty curry. This is generally served with rice or roti. This is my favorite dish and it makes you lick your fingers till the last bit. 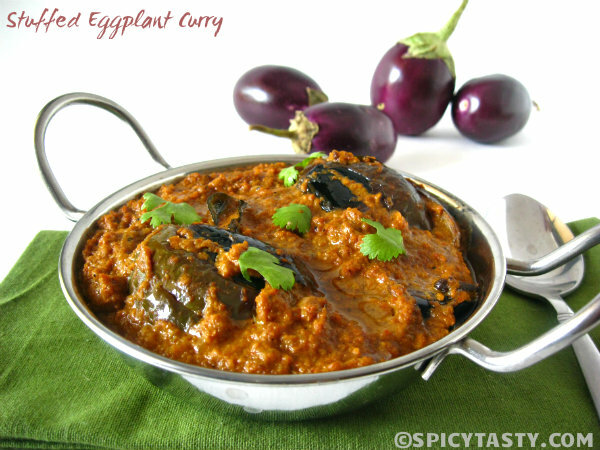 Also try our Ennai Kathirikkai which is another exotic eggplant dish. Dry roast peanuts and grind to a coarse powder. 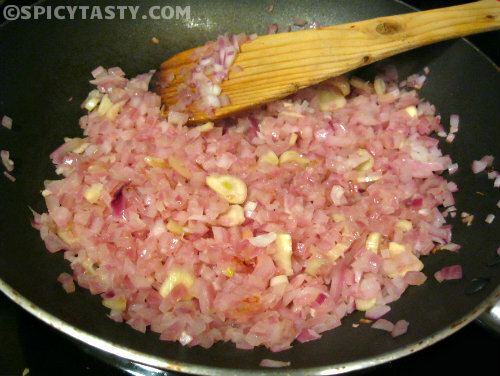 Heat a tsp of oil in a pan and saute onions and finely chopped garlic with a little salt until onions turn pink and translucent. Transfer it to a bowl and add red chili powder, coriander powder, garam masala and peanut powder. Combine everything well. 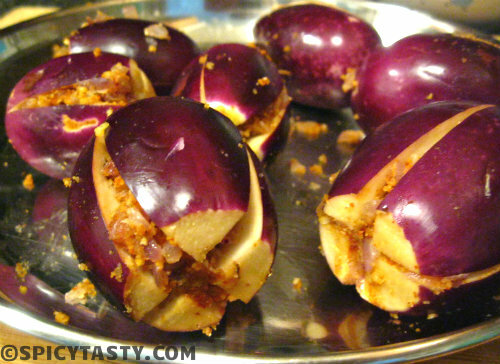 Wash and cut off the stem of eggplant and make a cross by slitting them until 3/4 th leaving the bottom portion intact. 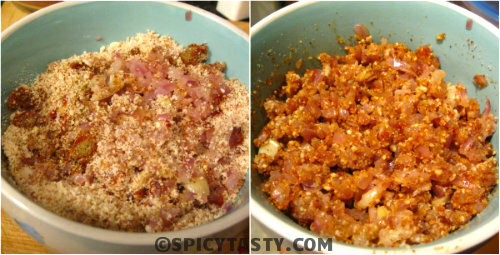 Stuff them with the onion masala and grind the remaining masala to a paste with a little water. 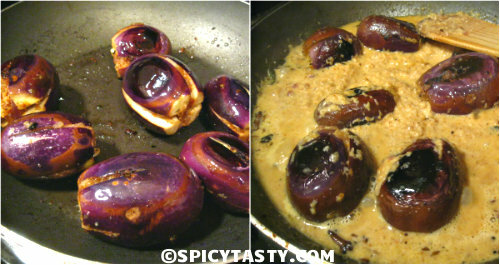 Heat a tbsp of oil in a pan and saute the stuffed eggplants over medium heat by turning them often so that all sides are cooked. When it is 3/4 th cooked add the remaining oil followed by cinnamon, cloves, methi seeds and curry leaves. Add ground masala and 1/2 cup of water and simmer the heat. Cover and cook for 15 minutes stirring every 5 minutes in between. Add tamarind juice and let it cook for another 15 minutes or until the gravy changes color and oil starts oozing out. Baingan curry is ready. 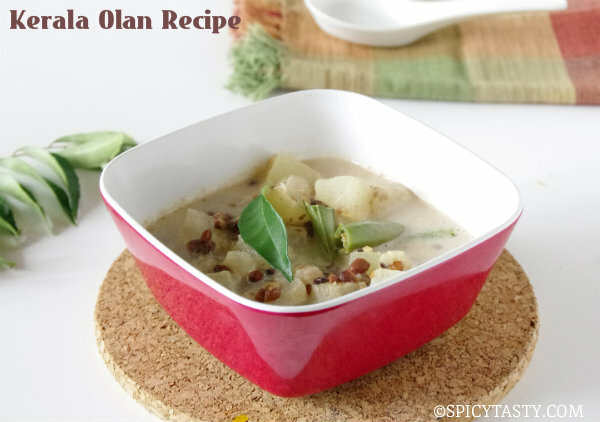 Serve hot with cooked rice or roti. Note: You can add a little paprika powder to give a nice red color to the gravy. Wow…look tasty…wonderful and awesome looking dish. 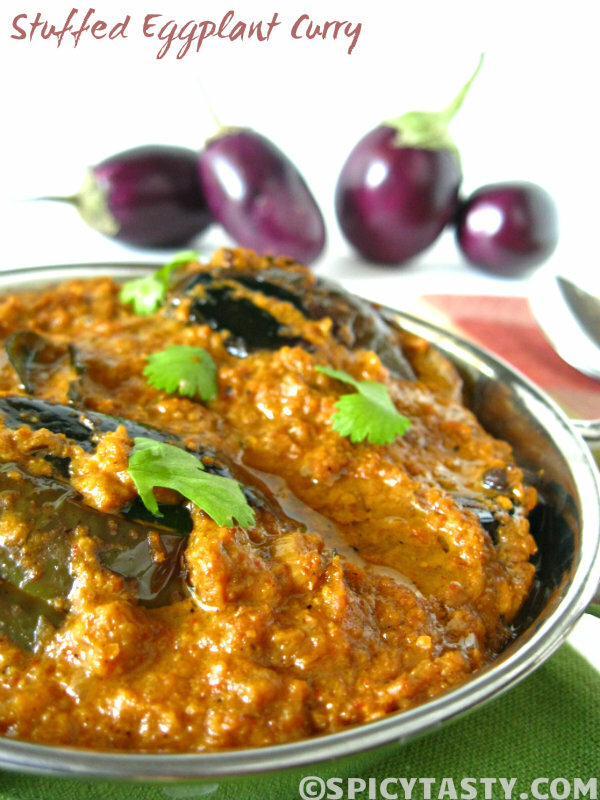 Hi Nithu the baingan masala recipe looks tempting. I am so excited to have found your blog and this recipe! 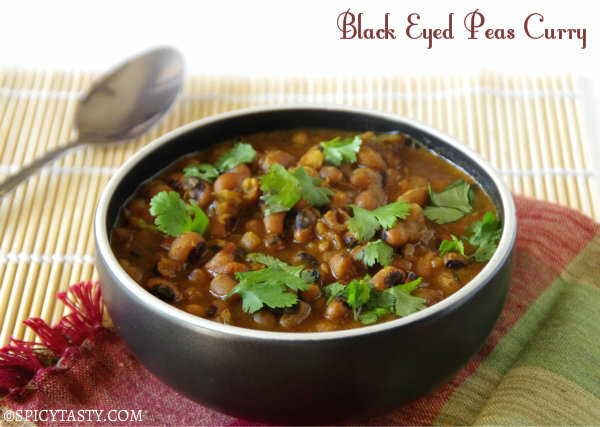 I am a HUGE fan of Bhaingan Bharta and I love your addition of roasted peanut powder to this dish. I can’t wait to try it! Thanks!! !